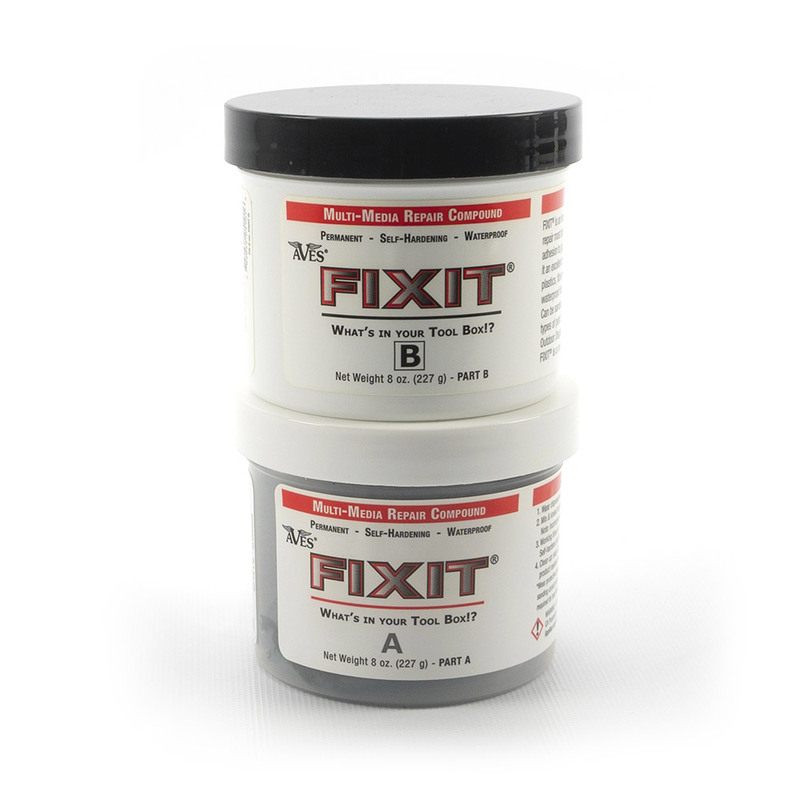 FIXIT® is an innovative multi-media repair compound used to permanently fill, bond, seal, & repair most anything. 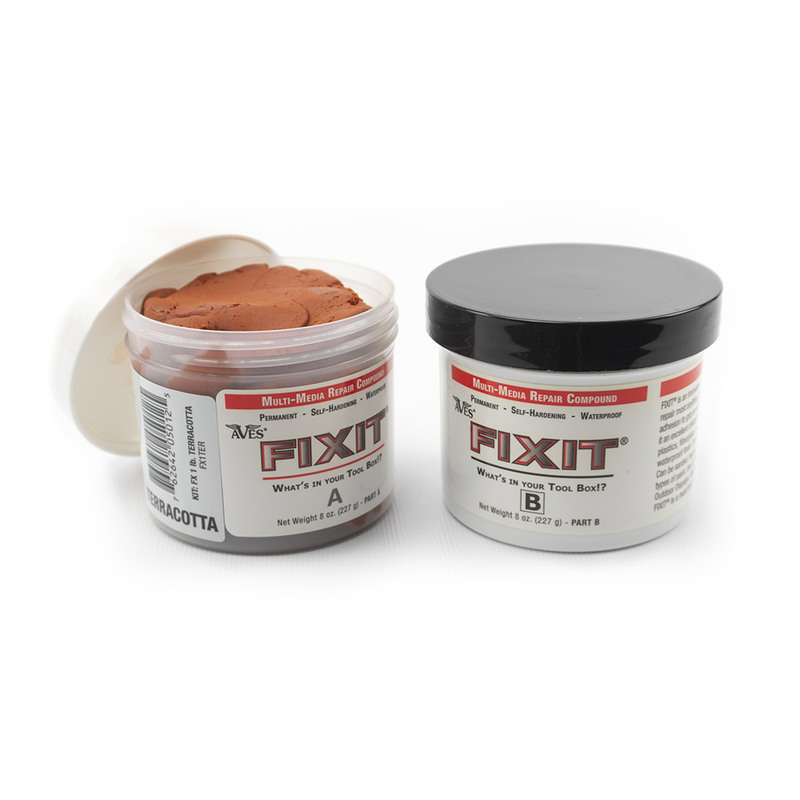 Its smooth putty-like consistency combines with industrial strength adhesion to grip on to your projects. 1-3 hour work time allows you to shape & smooth making it an excellent choice for customizing, fabricating & rebuilding parts. Works on many surfaces. Cures rock hard; waterproof finish. Sets-up underwater; UV ray & fuel resistant, takes heat up to 500˚ F. Sand, tap, drill, machine without chipping, cracking or flaking. Accepts all types of paint. Use on tough jobs: industrial & home repairs, auto, outdoor & marine projects. Adheres to: Itself (in any stage of set up before or after curing), other epoxies, polymers, Metals, Plastics, Fiberglass, Ceramic, Stone, Masonry, Tile, Wood, & more! Wear disposable gloves to measure equal parts of A & B. Always retrieve parts A & B with different tools. Mix & knead together for 2 minutes until thoroughly combined and a uniform color is achieved. Note incomplete mixing will give poor results. Allow mixed product to rest 5 minutes for better handling. 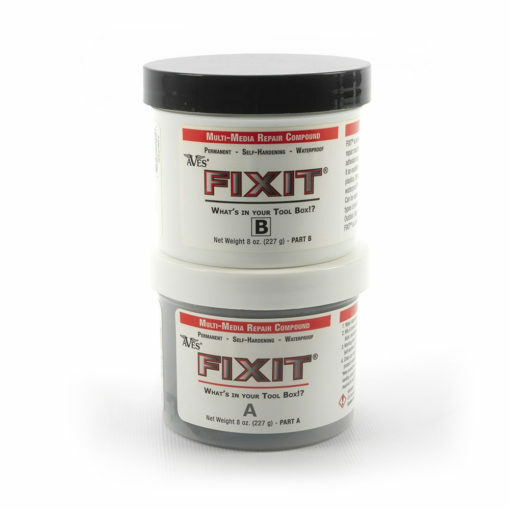 FIXIT® is ready to use; working time is 1-3 hours. Shape as desired. Smooth or texture with a wet finger, brush, Q-tip or sculpting tool. Self-hardens (NO BAKING); 24 hour full cure to a rock hard, semi-gloss finish. Clean up: soap & water or Aves® Safety Solvent (very helpful for smoothing, removing finger prints & cleaning up pigment / product residue before set-up). Finish as desired. Paint wet or dry. Outdoor & Marine Quality! *Wear protective gloves [e.g., nitrile or equivalent] when combining parts A and B. Wear a dust mask and safety glasses when sanding cured product…[P280] *Keep out of reach of children…[P102] *Safe for adults when used as directed. 24 hour full cure required for hard finishing purposes such as sanding, carving, drilling, machining, etc. Keep containers sealed when not in use. Freeze-Thaw-Stable. WARNING – H317 May cause an allergic skin reaction. H320 Causes eye irritation. CA Proposition 65 DANGER – contains crystalline silica known to be a human carcinogen via respiratory route. Applies only to the cured clay product when sanded or abraded in some manner to create airborne dust. Patches and fills holes and cracks, and fabricates parts. Use on doors, walls, dry wall & floors, tile, cement, grouting, chairs, cabinets, furniture, toys & dolls, jewelry, statues, tools, machine parts, and so much more. 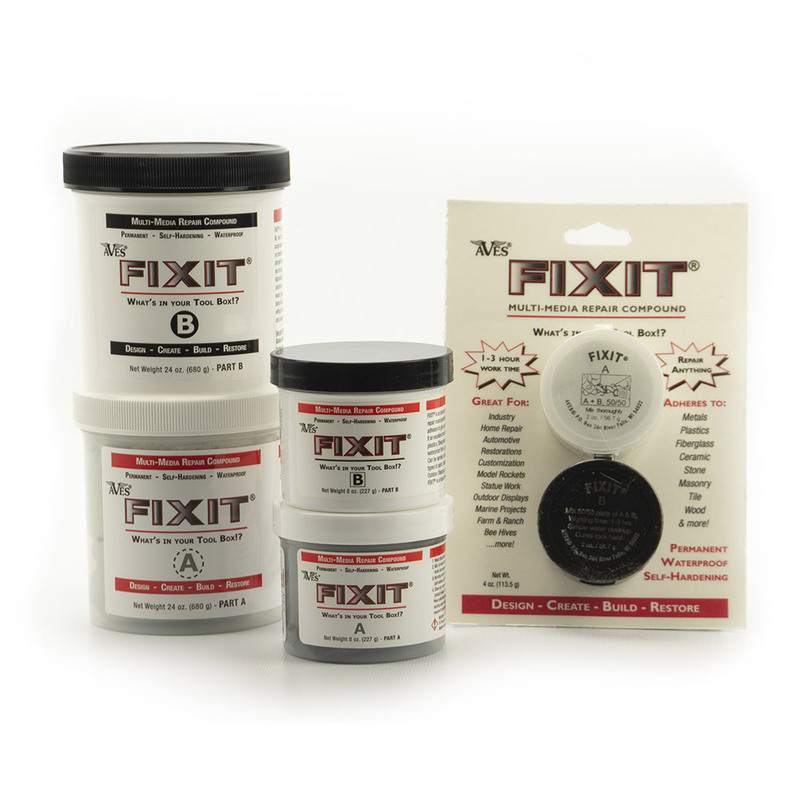 Ideal for antique restorations. Sinks, oil and water tanks, seals and plugs leaks, etc. Permanent custom formed gaskets. Boat, pool & aquarium repairs. Safe for lines carrying potable water. Dent/hole repairing. Great for fuel tanks, radiators, exhaust systems, metals and dissimilar component bonding. Safe up to 500 degrees F.
Indoor & outdoor displays. Theme park & aquarium repairs and fabrications. Motion picture studio effects and props. Statue repairs. Use in place of lead for stained glass windows. Model, hobby and craft uses such as rocket fillets and reinforcements, model cars, trucks, boats, planes, etc., and doll and figure character repairs, fabrications & customization. 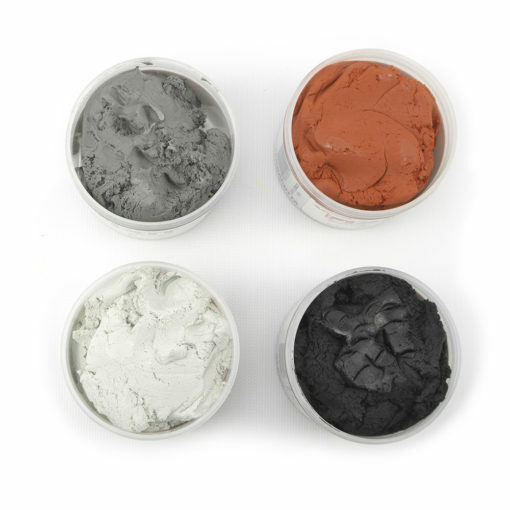 *Wearing gloves when mixing A+B is not only helpful for clean up, but ensures thorough mixing of the product.